OKUDA SAN MIGUEL’s unique iconographic language of multicolored geometric structures and patterns on the streets, railroads and abandoned factories around the globe has made him one of the world’s most recognizable street artists of today. Rainbow geometric architectures blend with organic shapes, bodies without identity, headless animals and symbols that encourage reflection in artistic pieces that could be categorized as Pop Surrealism with a clear essence of street forms. His works often raise questions about existentialism, the universe, the infinite, and the meaning of life. 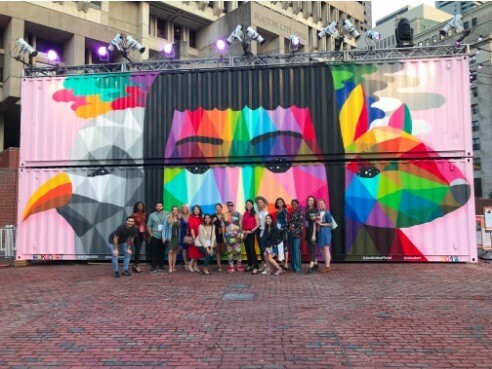 Okuda’s HUBweek mural speaks to the relationship between humans and animals, and to themes of respect, diversity, and harmony among beings and with our environment. The artist’s works can be seen in streets and galleries around the world: Brazil, Chile, India, Japan, Mali, Mozambique, Mexico, Peru, South Africa, United States, and throughout the European continent. Seaport proudly presents new works by Okuda San Miguel during HUBweek and in Seaport.